Nepal logjam is a three part article series. Make sure you’ve read previous parts, before proceeding further. Why CA can’t deliver a new Constitution for Nepal. Why four Prime ministers have changed in Nepal between 2008 to 2011.
how and why India’s Nepal Policy (2005)=#epicfail. After the ceasefire and peace accord, around 20,000 Maoist combatants had been living in the temporary Cantonments. (many of them are child-soldiers). they have deposited their weapons to UN-supervised containers. 6500 of them were to be absorbed in army. (disregarding educational/age requirements). Rest of the Maoist combatants were promised a financial package of 5 to 8 lakh Nepali rupees, each. So they can go back to their village/families and start their lives again with business, farming whatever. While Prachanda demands 9000 Maoists to be recruited in Army but the Ground reality= barely 3000 Maoist rebels actually wanted to join the army. Rest of them are uncomfortable working with their former enemy (army), with whom they had fought for more than 10 years. Most of them are tired of the “revolution”, they prefer to accept cash, go back home, enjoy family life. Most of them are not comfortable with the rigorous training and discipline of regular army. Some of the senior Maoist rebels, want to be absorbed as Colonel, Brigadier and other higher posts. But in most cases, Army is reluctant to give them such higher ranks, given their old age and low education. At the end of 2012, barely 1500 Maoists joined the army. Others accepted ca$h, deposited weapons and left for home. In the Indian villages, Sarpanch and Patwaari create fake-job cards and withdraw MNREGA money. In Nepal, the Maoists had submitted their weapons to UN-Containers and they were living in temporary cantonments. They were given food, ration and salary according to their ranks. (This money was from aid given by UN, EU, Germany etc. donors). Problem: Many of the Maoists left the camp. Yet money is withdrawn in their name. Similarly fake id cards were created and money was siphoned off in ghost accounts. Prachanda and his favored Maoist commanders are running this “Maoist-MNREGA”scam. Prachanda has made truckload of cash out of this game, bought expensive watches, , race-horses, SUV cars, luxury apartments, iphone5 etc.etc.etc. This has created deep resentment and internal fighting among the Maoist rank and file. In several camps, the Maoist combatants started rioting, saying that Pro-Prachanda commanders are making truckload of cash through fake-ID cards (“Maoist-MNREGA”scam.). Prime Minister Bhattarai (of Maoist party) had to call in army to stop these riots. These has further increased the bitterness among Maoist-cadres, because Bhattarai called up their old enemy (army) for help! After this incident, Prachanda had to install metal-detectors at his home, because those angry rebels planning to attack him! Mohan Baidya Kiran + Baburam Bhattarai (Present Prime Minister) as second in line. Kiran on the other hand, has sizable following in the Maoist-party. Both hate eachother. Mohan Baidya Kiran You’ve made Bhattarai the Prime minister . He is making truckload of ca$h, I hate him. Prachanda Ya but he is more “acceptable” to international players, including India and USA. So let him stay there for a while. Baidya Whatever dude. Just tell me what’s your next plan. Well, I want new Constitution to have “powerful President” directly elected by people. So that I can become the Main Boss of Nepal. Bhattarai is only there to keep the seat warm for me. Problem is other political parties are not in favor of Presidential system of government! Dude, those parties never support you to establish this Presidential system! So, I suggest we leave this Constituent assembly and again start violent agitation just like the good ol’ Maoist! I’ll fully support you in that. Only one condition : get rid of Baburam Bhattarai. Because I hate that guy. If we start violent struggle again, we’ll lose support of India and the international community. Besides, most of our Maoist brethren in Cantonments have accepted ca$h, deposited their weapons and left for their homes. It’ll be hard to mobilize people again for a new round of armed struggle. Kiran Then you leave me no choice. I’ll make my own new party. Many of Maoist cadres and mid-level leaders, are also disillusioned with Prachanda and Baburam, particularly because they are making truckload of cash via corruption (including Maoist MNREGA). So, when Kiran left the party, around 1/3rd of cadres from Prachanda’s original Maoist party also joined Kiran’s party. Babu has sold our country to India by signing the Bilateral Investment Promotion and Protection Agreement (BIPPA) agreement. Babu has given contract of upgrading Nepalese airports, to an Indian company without inviting bids. Only the Army, judiciary and police are legitimate state apparatus. I don’t recognise the legitimacy of the President Ram Baran Yadav or Prime Minister Baburam Bhattarai. Prachanda and Babu are responsible for not delivering People’s Constitution. President Ram Baran Yadav only consults the big four political parties. He doesn’t listen to the small parties’ concerns. We want an all sides-round table conference to decide the future of Nepal and draft Constitution for Nepal. We’ll not mind going back to the armed struggle, if ^this is not done. India wants to “colonise” our small country Nepal. 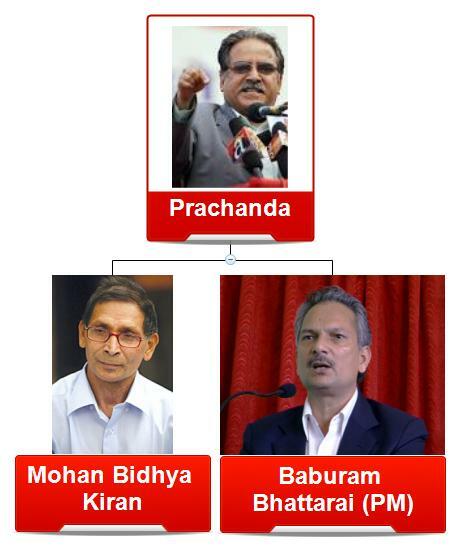 Both Prachanda and Babu are puppets in the hands of Indian Government. Nepal’s relations with India must be based on ‘equality’, regarding border-disputes, trade and transit rights. India is trying to “culturally invade” Nepal via Hindi films and songs. We’ll prevent vehicles with Indian number plates, including goods carriers, from entering Nepal. Please note: Whatever Kiran is saying against India= Nothing new. During civil war (1996-2006), Prachanda had also said similar Anti-India things. But India helped him broker peace with Government, so he toned down his opposition. When Kiran again started agitating against India (ban on Indian films, songs, vehicles), the Nepalese Government (headed by Maoist PM Baburam Bhattarai), ordered the police to take strict action against these rowdy elements. India helps him get a plump ministerial position in Baburam’s cabinet OR directly makes Kiran the PM. India starts looking @Kiran as the “permanent-alternative” to Prachanda/Baburam. Then India will start showering money and support to him, just like President Obama does to Hamid Karzai in Afghanistan. Recall that Kiran left the party because Prachanda did not remove Babu from PM’s post. But that doesn’t mean Babu and Prachanda are best friends like Jai and Veeru. Prachanda had ordered Baburam not to attend this RIO+20 summit. Still Baburam went to the summit. So far: The Constituent Assembly of Nepal, is unable to deliver a new Constitution. Because there is severe difference between Maoist party and other parties. Right now Baburam Bhattarai of Maoist Party is the Prime Minister. But Baburam Bhattarai plays a new trick: He passes a resolution to extend Constituent Assembly’s life by 3 more months. This goes against the order of Supreme Court. So, President Ram Baran Yadav starts taking legal opinion on what to do next. The legal-experts advice him to remove this Baburam Bhattarai and call for new elections. Finally President Ram Baran Yadav removed Prime Minister Baburam Bhattarai from his post, but asked him to continue as a caretaker till an alternative arrangement is made. 2008 Elections were held for CA. But it did not deliver result. May 2012: President Ram Baran Yadav dissolves the CA, as per Supreme Court order. President also removes Baburam as PM, but asks him to continue as caretaker prime minister, until new arrangements are made. Baburam to public I’ll work as the caretaker PM.We’ll hold general elections on November 2012 for new CA.Then I’ll handover powers to newly elected PM. Election Commission(EC) But how’s that possible? First problem: The interim constitution of 2007 doesn’t have any provision for repeat elections! Second problem: all of the Election Commissioners are retiring in October 2012. And new election Commissioners cannot be appointed without approval of “Full-fledged” PM+Opposition leader+Speaker+Chief Justice. EC You’re not a “Full” PM, your just a caretaker PM. So, you cannot appoint new Election Commissioners, because you are just a caretaker Prime minister! It means after October 2012, there will be no election Commissioners, then how are you going to hold elections in November 2012?? Baburam Oh well, then I’m the luckiest guy alive! I’ll continue being caretaker PM forever! And though there is no parliament in session. I will continue ruling over this country via ordinances. The political parties, fail to reach consensus. So Baburam continues being a caretaker PM. But India didnt give any open support. So he returns empty handed. In the meantime, he is behaving like a full-fledged Prime minister, and has been taking major decisions on hydel projects, foreign investment and promotions of security officials, besides loaning private companies huge sums of money from national deposit schemes. Bhattarai feels the absence of a parliament grants him immunity from wider scrutiny and accountability. So far: CA failed to deliver result. President dissolved CA, removed Baburam as PM but asked him to continue as a caretaker PM. Baburam promised to hold elections in Nov 2012. But elections are not held in November 2012. Since we’ve failed to deliver result (Constitution), the UN, India etc. won’t trust us much. And if King Gyanendra tries to make some move, who knows, India might even support him! So, if you don’t support us, then King Gyanendra and monarchy will return. And he’ll take the whole pie by himself. We’ve an enemy in common (King) so support us. We pass a new resolution to “revive” the existing Constituent Assembly. To hell with President, if he opposes, we’ll remove him by passing another resolution! sir i never get any update notification on my mail…plz tell me why it is so…i have done the subscripition many times but still…. please check your spam folder. mails are sent around 6AM every morning. Jai n Veeru analogy was mindblowing..! Waiting for the third n final part. Another gem!..The way u have described everything is simply superb..It simply makes our preparation much easier..Thanks a lot! did nt explain the nature of judiciary,army nd police..r they autonomous or wt? Again a precise & humorous way of presenting the hard information of Power Struggles In Nepal begining from 1990 to present Continuing with quick shed on British Support till 1947 for the exchange of Gorkha People inducted in erstwhile British Indian Army.The Power Backlashes based on issues of Federalism & System of Governance after dissolution of Parliament by King & then again reappointing it.Just like any Historic Event Filled with lot of ups, Downs & Short straights.Totally a blunt coverage.